Bruce Ruben brings back to life in a judicious, meticulous, and thoughtful way an overlooked but highly significant personage in nineteenth-century Judaism in Germany, Russia, and America. The saga of Max Lilienthal, rabbi, educator, and public figure, is both absorbing in itself and illuminates an era of intense challenges and creative change in the emergence of liberal Judaism. When Congregation Bene Israel hired him to come to Cincinnati in 1854, Rabbi Max Lilienthal (1814–82) seized the opportunity to work with his friend Isaac M. Wise. Together, Lilienthal and Wise forged the institutional foundations for the American Reform movement: the Union of American Hebrew Congregations and Hebrew Union College. In Max Lilienthal: The Making of the American Rabbinate, author Bruce L. Ruben investigates the central role Lilienthal played in creating new institutions and leadership models to bring his immigrant community into the mainstream of American society. Ruben’s biography shines a light on this prominent rabbi and educator who is treated by most American Jewish historians as, at best, Wise’s collaborator. Ruben examines Lilienthal’s early career, including how his fervent Haskalah ideology was shaped by tensions within early nineteenth-century German Jewish society and how he tried to implement that ideology in his attempt to modernize Russian Jewish education. After he immigrated to America to serve three traditional New York German synagogues, he clashed with lay leadership. Ruben examines this lay-clergy power struggle and how Lilienthal resolved it over his long career. 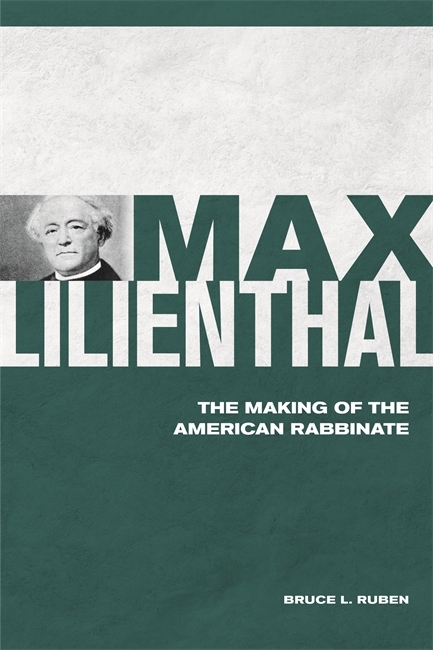 Max Lilienthal: The Making of the American Rabbinate also details the rabbi’s many accomplishments, including his creation of a nationally recognized private Jewish school and the founding of the precursor to the Central Conference of American Rabbis. He also was the first rabbi to preach in a Christian church. Even more significantly, Ruben argues that Lilienthal created an unprecedented new American model for the rabbinate, in which the rabbi played a prominent role in civic life. More than a biography, this volume is a case study of the impact of American culture on Judaism and its leadership, as Ruben shows how Lilienthal embraced an increasingly radical Reform ideology influenced by a mixture of American and European ideas. Students of German Haskalah and historians of American Judaism and the Reform movement will appreciate this biography that fills an important gap in the history of American Jewry. Bruce L. Ruben is the director of the School of Sacred Music at Hebrew Union College–Jewish Institute of Religion in New York. Previously he served for twenty years as the cantor of Temple Shaaray Tefila and earned his doctorate in Jewish history from the Graduate Center of the City University of New York. This scholarly work should be of interest to college and university students and is recommended for academic library collections. It is beautifully and engagingly written, and well-edited. . . Ruben deftly summaries Lilienthal’s memoirs and many of his scholarly and popular articles, written in German and in English. He provides helpful detail about the histories of the Jewish communities and congregations Lilienthal served, about Lilienthal’s own personal evolution and 'reinvention' from Orthodox to Reform. This book is a valuable, insightful, and lucid portrayal of an important figure in American Jewish history. It is a thoughtful and rewarding account that places Lilienthal in the broad context of his world. Bruce Ruben brings back to life in a judicious, meticulous, and thoughtful way an overlooked but highly significant personage in nineteenth-century Judaism in Germany, Russia, and America. The saga of Max Lilienthal, rabbi, educator, and public figure, is both absorbing in itself and illuminates an era of intense challenges and creative change in the emergence of liberal Judaism." Religious innovator and educator Max Lilienthal finally receives his due in Bruce Ruben's well-researched and thorough biography. Lilienthal's life, as illuminated by Ruben, provides a useful lens through which to understand the development of American Reform Judaism, the American rabbinate, and American Jewish life during the mid-nineteenth century. Lilienthal's predicament as a moderate and peacemaker in an age when many were swept up in political and religious causes that drove them to the extremes provides the contemporary reader with much food for thought." Ruben has done a yeoman's job of collecting, reviewing, and synthesizing both primary and secondary materials. The result is a highly readable, well-informed landmark study of Lilienthal, long in need of a first-class biographer."